This is the most recent in a rather long series of database management tools I've written, but until now none satisfied my wishes — interacting with databases can be tricky. My past projects include JDBClient, a very similar program that interacts with a MySQL server and from which I ported much of this project's code, DataProspector (Java) and PHP Writer (PHP), and DBCLient, written in Python, which turned out to be a prototype for JDBClient. These were reasonably successful programs, but as time passed I decided they weren't powerful or convenient enough. For this project I set a few goals — I wanted a cross-platform application, I wanted a powerful, easy-to-use query dialog I could use to issue complex queries on a field-by-field basis. I wanted a built-in interactive SQL terminal for complex database tasks that require more than a predefined solution. I also wanted an easy-to-use data editor that I could use for everyday database entries as well as more complex tasks. And I wanted a flexible table display with individually sortable columns. The good news is that this program exceeds my highest expectations, primarily because the many prior projects taught me what I wanted and what was difficult to achieve. For more depth about databases and SQL, be sure to visit my MySQL tutorial (SQLite SQL differs only in small ways from canonical SQL). JSQLiteClient is a Java program that runs on nearly any platform. JSQLiteClient is released under the GPL, it is Copyright © 2018, P. Lutus, and it's free. Some SQLite/SQLite3 database files, easily acquired or created. The most recent Java runtime engine from http://java.com. One of the downloads in the following list. Linux and other non-Windows platforms: the Java executable JSQLiteClient.jar. Download this file, place it in any convenient location. From the chosen directory, type: "java -jar JSQLiteClient.jar"
The above can be made part of a shell script. Windows: the Windows JSQLiteClient installation executable JSQLiteClient.exe. Download and install the above installation package in the usual way. A JSQLiteClient program icon will be placed on your desktop. JSQLiteClient is Copyright © 2018, P. Lutus, and is released under the GPL. 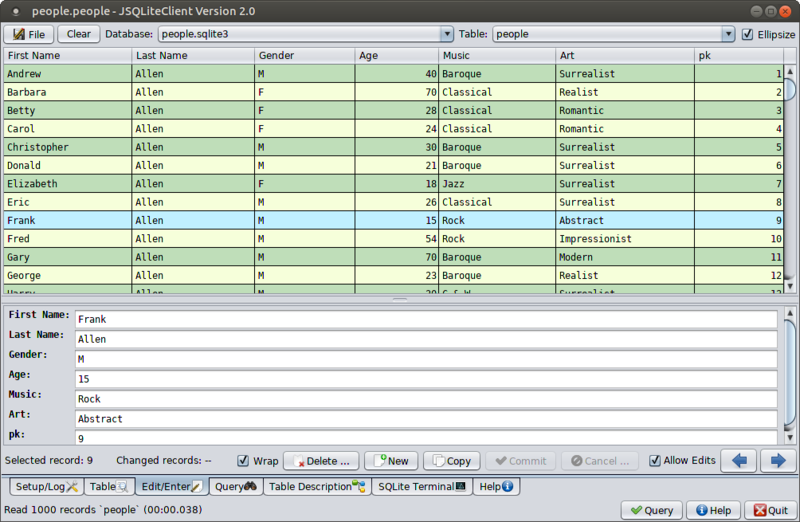 Practice/tutorial example database file people.sqlite3. Used in the JSQLiteClient help file for some examples, and useful to gain familiarity with database operations. Just downoad the file, put it anywhere convenient, and open it with JSQLiteClient. Make sure you have the most recent Java runtime engine from java.com. If you try to run JSQLiteClient on an out-of-date Java runtime engine, it will not run. This is the most common error report I get from JSQLiteClient users — caused by an out-of-date Java runtime engine. I have received a number of error reports from JSQLiteClient users, and all of them result from their trying to run JSQLiteClient on an out-of-date Java runtime engine. Proactively solve this problem by using only the most recent Java runtime engine, available at http://java.com. If you see an error message and/or if JSQLiteClient won't run, consider this possibility first — that your Java runtime engine is out of date. For general instruction in the use of SQL, I recommend my online tutorial. JSQLiteClient is Copyright © 2018, P. Lutus, it is released under the GPL, and it is free. 05.07.2018 Version 2.1. Fixed some minor issues having to do with how databases are ordered in the DB list. 04.10.2018 Version 2.0. Fixed a bug that erroneously deleted the database list, added the currently active DB and table to the program name on the title bar. 01.03.2018 Version 1.9. Refactored the database file selection logic and configuration storage. 01.02.2018 Version 1.8. Improved the behavior of the database list, fixed some small annoyances. 12.30.2017 Version 1.7. Made more small changes and enhancements, updated the documentation to mention that JSQLiteClient supports the REGEXP keyword in queries (a feature not provided by SQLite itself). 12.25.2017 Version 1.6. Solved a shortcoming in SQLite that prevented correct rendering of trailing zeros in floating-point values. If the user specifies a table field as (for example) "decimal(10,2)", SQLiteClient will display all values with two decimal places including trailing zeros — something SQLite won't do on its own. 12.24.2017 Version 1.5. Fixed a bug that prevented correct Windows file path parsing. 12.24.2017 Version 1.4. Recoded the database selector list for better functionality and ease of use (short database names plus full paths as tooltip text). 11.26.2017 Version 1.3. Fixed a bug that wrongly moved to the edit pane on each query result. 11.26.2017 Version 1.2. Fixed a bug that failed to list views as well as tables in the table drop-down list. 11.19.2017 Version 1.1. Fixed a number of small issues that came up in testing. 11.17.2017 Version 1.0. Initial public release — much of the code was ported from my very similar program that relies on MySQL databases named JDBClient.